After you’ve picked out your guitar, you’re going to need to look at electric guitar amps. Or at least something that will let you plug in and hear what you’re playing. Just like with guitars and effects, there are way too many guitar amp makes and models available to cover them all here. Unless you have a clear idea in your head at the beginning, your amplifier needs will probably evolve over time. Let’s say you start off playing metal (or at least learning how to play metal), then one day you hear something cool that leads you to a different style of rock music. Learning different styles will help define your ideal tone. This is why it’s a good idea to jam with other musicians. You get exposed to different tones, which helps you clarify your sound. Head straight to the guitar amp manufacturers section. 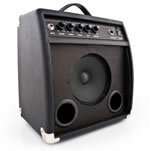 Just like with a guitar, you might be lucky enough to have a friend or family member that has a guitar amp you can use. If that’s not the case, you'll have to do it the old fashioned way – tap your savings account or go out and earn the cash to get your first rig. But what if you just shelled out your savings for an axe, and the job is paying your living expenses, so your wallet’s a little thin? That’s OK, because it doesn't have to be expensive to get a new (or used) guitar amp. There's a number of different options to choose from that don't break the bank. Some low cost ideas for buying electric guitar amps can take some time to line up, but they're usually worth it. You will have to do some legwork and check (try) equipment out, but you can find some really good deals if you take the time and do your research. Heck, sometimes just telling people that you're hunting can help you find that guitar amp deal. Word-of-mouth is still one of the best ways to find bargains! Of course, as you get out there and start plugging into electric guitar amps, you have to know a little about how to choose the right amp for you. Again a key factor will be cash, but there are other things to take into consideration, especially if you’re checking out some of the low cost avenues. Knowing what you want, what your musical style is and how you want to sound are the important things to keep in mind. There are some solid guidelines to help you choose the right guitar amp. After learning a few things about how to choose a good amp, you’ll be able to narrow your decision down to a handful of makes and models. You may also want to know a bit about how to use the controls on electric guitar amps. This is also helpful in choosing the amp that gives you the sound you're after. You’ll definitely want to check out guitar amp reviews online if you can find them. Google is your friend... To get you started, Premier Guitar, Audiofanzine and Music Radar all offer reviews for guitars and amplifiers. If you’ve started hunting for electric guitar amps and you want to get a feel for who makes what, there are loads of amp manufacturers out there. Some have pretty decent websites with lots of information available, while with others you’ll have to rely on a reseller to get your info. Hey, that’s what customer service is for, right? Right… Enough on that. Here's a listing of some guitar amp manufacturers that have made a name for themselves over the years. Most of these guys have been around since before the Beatles, so they offer many years of amp building experience. Others have gotten into the game more recently, but don't let that discourage you from looking at them. These guys learned everything they know from working with and for the vintage guys! Most of the big players have affordable amps available. The cheaper electric guitar amps might not have the tone you'd expect from a big name, but for a practice guitar amp or for a new guitar player, cheap is good. As you get better, you can start eyeballin' better amps for recording and playing live, if that's your thing.